The explosion of railways in West Cumberland during the latter half of the 19th century was very much due to the mineral wealth found in west Cumberland at that time. There was coal stretching from Whitehaven along the coast to Maryport and inland to Aspatria and Wigton. Then there was iron ore in the Egremont, Cleator Moor and Frizington area. (The rich haematite iron ore that was being mined in this area was in great demand for the Bessemer processes because it was particularly low in phosphorus and sulphur.) We also had limestone lying with the iron ore.
With the proximity of these raw materials the scene was set for an iron making industry. But the ore was not mined in any substantial quantity until the mid 18th century and then very little was used locally. The bulk of the ore was shipped out through Whitehaven to Scotland, South Wales and other parts of the country. At this time all the transportation was done by pack horse and horse and cart. The early furnace at Maryport was lucky in that it was close to the sea and received most of its ore from the Barrow area by ship. But it was short of river water for blowing and cooling purposes some times, but that’s another story! With the coming of the steam engine it also allowed the old water driven furnaces to move away from the rivers that drove the blowers and other machines. So what caused the change? As I have just mentioned – the steam engine. It was the introduction of the steam engine which allowed the development of the railways. By 1844 there was a railway connecting Carlisle to Whitehaven via the coast and extended to Broughton – in – Furness by 1850. But there was no link into the iron ore field from this line and it was obvious by now that a line was required. This requirement was filled in 1855 by the Whitehaven, Cleator and Egremont Railway which left the existing Whitehaven and Barrow line about one mile south of Corkickle station at Mirehouse. This line opened up the Cumberland ore field to the coastal line and better output of ore shipments from Whitehaven. We can assume that the local entrepreneurs became aware of the possibilities. With all the raw materials available for the smelting of iron taking the ore to a point nearer the ports for smelting would be attractive. At this time the Whitehaven, Cleator and Egremont Railway only went as far as Moor Row and Frizington but was extended to Rowrah and then on to Wrights Green (Lamplugh) in 1862 and then reaching Marron Junction on the Cockermouth Workington line by 1866. By now the railways were well established and they were moving vast amounts of raw materials in and out of Cumberland – the iron ore and limestone to the furnaces, coal to the ports and coke from Durham. 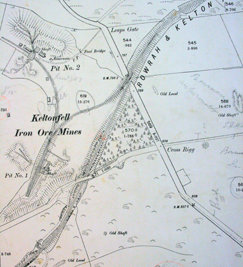 There had been some prospecting for iron ore in the Kelton area east of Rowrah and as early as 1853 a Thomas Carmichael had workings there as well as S & J Lindow by 1854. By 1869, it was eventually proved. There were three shafts sunk, one at Knockmurton and two at Kelton Fell. The mines at this time were owned by William Baird and Co. the well known Scottish Iron Master with a vast industrial empire in Scotland. Unfortunately these mines were working at a disadvantage as the nearest rail head was at Rowrah or Wrights Green (Lamplugh) some four or five miles away respectively. The only way to transport the ore was by horse and cart down hill to Rowrah or Lamplugh and during the winter months the roads were impassable. The ore had to be stock piled at the mines. R.E. Hewer mentions in his mining book “The Kelton & Knockmurton Iron Mines”. “The amount of money drawn from the rates to pay for the upkeep of the roads at Kelton in 1873 amounted to £180 – 15s – 0d, but repairs cost £318 – 17s – 3d such was the state of the road. This was all blamed on the carters for over loading the carts, spilling the ore and blocking the gutters.The owners of the mines were aware of the situation and Bairds give £40 towards the upkeep of the road.” It was suggested that Bairds should do more to help in the upkeep of the roads. It appears that they were the only company that helped towards the upkeep of the roads. We must remember that while the ore was coming down hill all the supplies had to go up the hill and as R.E. Hewer points out it cost 2/9d (13.75p) per ton for the ore to be transported to Rowrah (that’s down hill).The supplies of goods and coal cost 4/- (20p) on the return journey up the hill. So that was the situation in 1873 at the remote mines on the side of the fells above Ennerdale. This sort of situation would not be tolerated for long by any company where their mine was producing high quality ore and due to the lack of transport infrastructure they had to stockpile until the weather improved.It was quoted during the inquiry that the road gradients were 1 in 9, 1 in 9 ½, and 1 in 12 ½ and road widths of only 9 to 20 feet. It was not only Baird that wanted the railway built. The majority of the Kelton Township supported the railway and petitioned parliament to have it built. Kelton is one of the four townships of in the Lamplugh parish – the others being Lamplugh, Murton and Winder. Eventually Baird and company decided to promote a Railway of their own from a junction with the Whitehaven, Cleator and Egremont railway at Rowrah passing just north of Kirkland and terminating close to the Knockmurton mine in the valley of Leaps Beck between Murton Fell and Kelton Fell and at an elevation of 850 feet above sea level. This was a busy time in this area because there was iron “in them there hills.” People were digging for ore up in the Ennerdale valley and also higher up the fells above Knockmurton at Floutern Tarn. The route that the line was eventually built was not the first that was surveyed.See R.E. HEWERS book for a good description of them.Beyond the Knockmurton mine there was a level at Red Gill known as Iron Sett or Floutern Tarn which was owned by Faithful Cookson and Co. from 1870 to 71,then the Whitehaven iron company from 1872 to 1877.The agent was WH Hoskin.In 1871 a local surveyor named John Hoskins had surveyed the intended R&KF with an extension through to Red Gill using a three foot gauge. In 1872 another proposal to Red Gill was with a ¼ mile tunnel. Others proposed the use of stationary steam engines to haul the ore up from the mine to the transport. The proposal that I like is the standard gauge from Cockermouth up the Lorton valley passing Scale Hill Hotel, along the Mosedale Beck valley to the foot of Gale Fell.We could have caught the train to have lunch at the Kirkstile Inn! Another route was a bogie way commencing at Knockmurton mine and rising over High Pen crossing the upper section of Comb gill to Floutern Tarn and from there an incline would be required to the base of Gale Fell. The line was to be 2 foot gauge and double tracked. The incline was to be partially self acting but a stationary engine would be required above Floutern Tarn on the side of Gavel Fell. Without the proof that the deposits were economical £22,000 was too much of a gamble. Bairds were reluctant to build their own railway as the tariff on the WC&E was so high and when the latter was approached they refused saying it would not provide sufficient return on the capital investment to extend a branch up to Kelton.With the refusal of the WC&E to build the line Bairds had no option but to build the line themselves.Bairds were no strangers to building railways; they had laid many miles of track in and about Scotland. William Wallace was the first chairman but died in 1876 and was succeeded by Andrew Kirkwood McCosh (who had replaced Martin Boundy in the first year of the company’s existence). James Baird was the managing partner the Lonsdale Haematite Iron Company at Bransty Whitehaven. He was also later on (in 1887) a prime mover in the formation of the West Cumberland Ironmasters Association. Robert A Robinson, of Cockermouth was Chief Agent for Lord Lonsdale and was an original promoter for the Cleator and Workington junction Railway. Alexander Whitelaw, Great-Grandfather of William Whitelaw MP and one time manager at the Gartsherrie Ironworks and from 1860 a partner in William Baird and Company. In 1874 Baird’s were desperate for a rail link to the rail system. They had a contract with Messrs Bain & company at Harrington that had to be fulfilled and the ore was stock piled at the mine. The contract to build the line was given to a local contractor, Messrs. Harrison Hodgson of Workington, who agreed to build the line for £25,000.The points and crossings were supplied by W. Barningham & Company Pendleton Ironworks, Manchester, chairs from Hannay and Clark of Barrow. The construction of the embankments, cuttings and bridges commenced and for only a short length of line, some of these are impressive. There was an expensive delay during the construction when 400 tons of defective rails (at a cost of £9 a ton) from Barrow Haematite Steel Company were laid. Later on 105 ton of rails were supplied for additional track. The line was ready for opening on 11th November 1876 but the opening was delayed by a legal dispute with the WC&ER.The line eventually opened in January 1877. Inevitably during the building of the line there would be complaints and the one that’s documented is the loss of water to Rowrah Station and the answer was to have the contractor divert the beck to re-supply the station. Before and during Bairds building this line there was a lot of unrest between the iron masters and the WC&ER When in 1873 the WC&ER increased freight charges which were promptly copied by the North Western and Furness Companies was the finale straw for the iron masters. In 1874 the ironmasters propounded to run an independent line from Cleator Moor to Workington and on to Maryport. Now Baird’s must have seen the significance of this new line. As the WC&E. was the line they would have make a junction with at Rowrah and after the refusal from the WC&E to build a branch up to Kelton Fell I doubt that the relationship was very close. Baird’s had been in correspondence with the new C&WJR about a branch line from Distington to meet the R&KF with an end on junction at Rowrah. This branch was opened in May 1882 and this is Baird’s line. Bairds honoured the agreement with the WC&E until the new branch was completed and the end on junction was achieved by an over bridge over the WC&E west of Rowrah station with branches off to serve the Rowrah Hall and Rowrah Head Quarries. By this time the WC&E had lost its independence having been taken over by the L&NWR in 1878 and eventually jointly by the Furness railway in 1879. The old junction with the WC&E was reduced to a back shunt. Bairds agreed to supply the locos and rolling stock for the line except for private wagons supplied by the owners. A loco was purchased from Neilson and Company Glasgow to work the line. It was a 0-4-0 Saddle Tank loco and named Kelton Fell. This engine operated from the small shed at Sheriffs gate. This loco ended its working life working for the NCB at Gartshore. It was presented to the Scottish Railway Preservation Society in 1968 and can be seen at the Bo’ness Railway Falkirk. The railway has been built and the mines and limestone quarries have their access to the railway network. But, as with all industries, the iron industry of west Cumberland of that time had its highs and lows. The C&WJ were now working their line with their own locos to Rowrah and after 1889 also worked the limestone traffic on the R&KF. The line leaves Rowrah at point west of Rowrah station that became known as the Kelton Fell Junction and heads south east over some wet ground just after it leaves the main line and curves away to Sheriff’s Gate. It passes over a bridge that allowed access in to Rowrah Head Quarry and further on there is a cattle pass and a culvert for a stream. 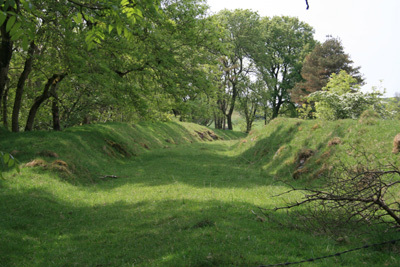 In this same area you can see an embankment and other ground workings and walls connected with the railway and the quarries. This area has had a lot of reclamation work done with the new cycle way from Whitehaven. The cycle way actually picks up the track bed just before you reach Sheriffs Gate. At Sheriffs Gate the line passes under the road but it’s now filled in and nothing much is left. Just after this bridge we have a turnout that goes to Salterhall limestone quarry and Salterhall iron ore mines owned by the Salter and Eskett Park Mining Company and this junction is known as Rowrah Junction. Most of the output from the quarry and the mines was consumed by the Cleator Moor ironworks. This off shoot as it was called was built at the same time as the line was built. 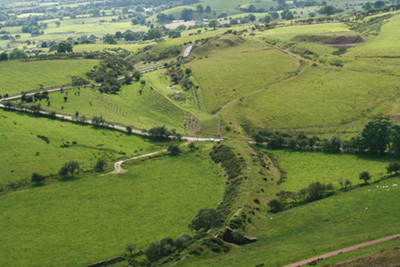 The off shoot that went in to Stockhowhall Quarry was built 6 years later. This Quarry was owned by James Bain and Company who also owned the Harrington Ironworks and Collieries. The C&WJ built a Signal box here complete with lattice work girder signals. The line continues on and just before Stockhow it passes over a cattle pass and then through the wood and curves round to the north east. It then passes over another cattle pass and climbs towards the village of Kirkland. Just before it crosses over the road bridge there was a one track siding with a coal and goods depot. The only remains left of this bridge is the one side abutment. The other abutment has been removed completely with a good part of an embankment for a local council storage area. Just to the back of this storage area there is a complete cattle pass. The line now curves round the north of the village and over the road bridge. There is nothing left to see except the high embankment to the next road bridge that goes over the farm road to Teathes. This is complete. To the north of this high embankment is the site of the Barbara mine. Not far after this point we start with the first cutting that takes the line under the road east of the village. (This bridge has been filled in). The line continues in an easterly direction and virtually parallel with the road and comes out of the cutting after about 400 meters. It has one more cattle bridge and some shallow cuttings before it reaches the Kelton Fell mine. Just before the mine it has another under pass and a road bridge over that has been removed completely and only thing left is a dip in the road. 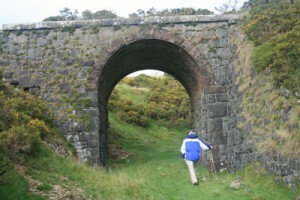 We still have one more bridge over the Leaps road that takes the line on to Knockmurton mine. On this last bridge there was the start of a turnout and a run round loop to allow shunting into Kelton mine. Just along from this last bridge there is the last cattle pass. This one is complete but has been robbed and is starting to deteriorate. By 1899 the mines at Kelton Fell and Knockmurton had started to decline and also the other mines up in that area. If we look at the map 1899 and 1925 we can see that some of the lines have gone and that the Salter mine had closed. Also the Stockhow limestone quarry had closed and the line was not used. The Salter mine had closed in 1903 by the Wyndham Mining Company due to water problems. The mine was reopened again in 1905 but it was only short lived and closed in 1910. The good times were coming to an end. The limestone traffic was now the main stay of the R&KF but in 1908 The Harrington Iron and Coal company (Successors to James Bain and Company) closed the Stockhow quarry but the Salter hall quarry stayed open.The main blow came when in 1913 after almost continuous working for 45 years the Kelton Fell mine closed down. The Knockmurton mine was by now also having problems and the outputs had dropped. They were searching for more ore but having serious problems with water and machinery breakdowns. The mine was abandoned in 1914.That is to say that Baird and Company terminated the lease. The lease for Knockmurton was taken up in 1920 but the mine was abandoned in 1923. During the World War one there was some traffic coming from the mines area but it was mostly the movement of waste from the mines for the war effort and was completed by 1916. Beyond the Rowrah Junction the line was in a very bad condition and derailments were a daily occurrence. There was the occasional coal wagon and van with farm feeding stuff to Kirkland. These trips were usually allotted to Moresby Coal Company’s saddle tanks that were based at Oatlands Colliery. The iron ore traffic from the Barbara and Bankstead pits (there was not much of it!) were allocated to the WC&E saddle tanks. After the war the Company was allowed to dispose of the line and the Whitehaven Haematite Iron Steel Company of Cleator Moor and the Slalter Quarry Company purchased the line in 1920 for £750 and an undisclosed sum for the track. The owners spent £600 on refurbishment but this was only spent on the line from the quarry to Rowrah.In 1923 under the regrouping it became part of the LMS. The goods depot was closed when the line changed hands. We must remember that by now motorised road transport was starting to arrive and the roads were a lot better. The last death blow was in 1927 when the last two remaining furnaces at Cleator Moor were blown out. The furnaces had only been on blast for a year after the disastrous coal strike. This had the knock on effect that the Salter quarry closed down and the company went into liquidation. This then was the last of the traffic on the last half mile of line from Rowrah Junction (Sheriff’s Gate) to the Kelton Fell junction at Rowrah. I would doubt that there would be any traffic on this line after this date but for the odd rake of wagons shunted out of the way. So that was the end of the working life of the Rowrah and Kelton Fell Railway. In 1933 the line was sold by the Whitehaven Haematite Iron and Steel Co. (Prior to its liquidation) to a Mr J W Kitchin of Moor Row. The track was lifted and sold for scrap in 1934. The Rowrah and Kelton Fell Railway Never carried passengers but still had an impact on the people in the area. The local mine owners built houses for their workers and Baird’s were no exception. There were 30 of these houses built in Kirkland. There are only two of the five terraces remaining today. The influx of people to the area is shown in the 1841 census and in the directory of Cumberland published in 1847 Kirkland is described as a hamlet. In the 1851 census there were 40 separate households with 170 inhabitants. Twenty six of the households depended on farming for their means of subsistence. By 1881 there were 472 people living in the township living in 60 dwellings. As you can see the hamlet has been transformed into a cosmopolitan village with people from all over the country including Scotland, Ireland, Wales, Isle of Man, Cornwall, Devon, Cumberland and even one Russia. The village contained: a dressmaker, Tailor, Boot and shoe maker, Blacksmith, Joinery building and Cartwright business; Alexander Twiname’s building Contracting and Grocery business; Pub (The Wheatsheaf), A Board School and a Methodist Chapel. There we have it. This small railway only three and half miles long transformed the area around it, as did all the railways in West Cumberland. I would like to thank all the following people in helping me with this project:- David Taylor, Mervyn Dodd, Jenny and staff at the Whitehaven and Carlisle Records Office. Information was gathered from the following books articles web sites. “The Iron & Steel Industry of West Cumberland” by JY Lancaster & D.R. Wattleworth. “The Kelton & Knockmurton Iron Mines” by R.E. Hewer. “Kelton Iron” the making of Kirkland by Geoff Brown & Donald Hayton. “Rowrah & Kelton Fell Railway” From the Whitehaven News parts 1 & 2 Oct. 1973 by Glasson. The Rowrah and Kelton Fell annual reports from years 1916/17/18, 1920, 1923, 1925, supplied by J.Y. Lancaster.